Passengers board a Durango & Silverton Narrow Gauge Railroad train on Friday afternoon. The train started running again after suspending operations June 1 when the 416 Fire broke out. For now, the train is using only diesel engines, not its usual steam-fired engines, because of fire danger. 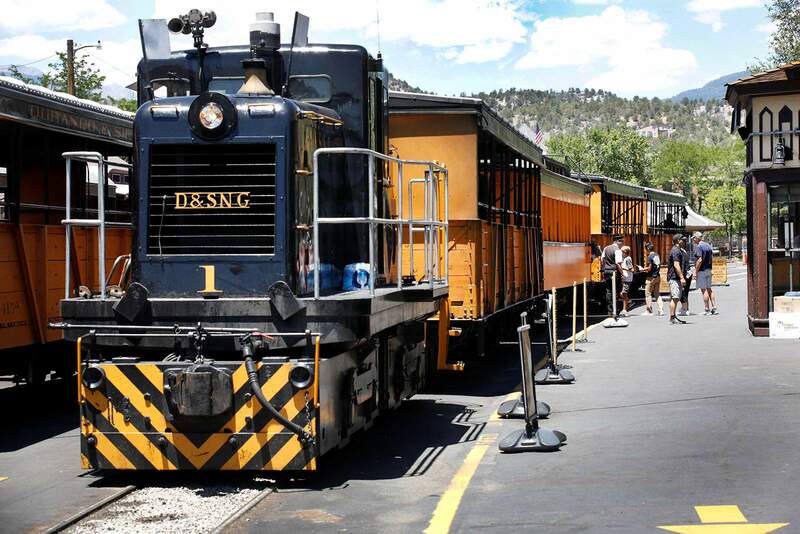 The Durango & Silverton Narrow Gauge Railroad announced Wednesday it will delay resuming its coal-fired steam-train passenger service until at least July 12. The decision is to “ensure guest, employee and partner safety during protracted severe drought and fire conditions,” according to a news release issued by the railroad. Southwest Colorado is in an “exceptional drought,” according to the U.S. Drought Monitor, and several restrictions have been in place to reduce the risk of wildfire. The D&SNG suspended service June 1 after the start of the 416 Fire about 10 miles north of Durango. The train service began running shorter trips with a diesel engine June 21. The railroad had originally said it would start running steam engines July 4. But based on current weather forecasts, which project an improved chance of precipitation in mid-July when monsoons are expected to hit the area, the railroad decided to wait until July 12. The train will use the additional time to complete repairs on the track in the fire-affected area and complete a full inspection of the rail line before it resumes using steam engines, according to the release. The railroad will continue to monitor mitigating factors in the coming days and could change when it will resume the service if there are not favorable weather patterns. Last week, railroad owner Al Harper vowed to La Plata County officials he would not run coal-fired steam engines until the region receives enough moisture to end the risk of high fire danger. Passengers who purchased tickets to Silverton that have been canceled have the options of receiving a full refund; transferring their tickets to ride the Cascade Canyon Express, a diesel train through the San Juan Mountains; or rescheduling their trips for later in the summer when the steam train service resumes. The 416 Fire, which remains active, has burned through more than 37,000 acres of land, mostly in the San Juan National Forest. The investigation of the fire’s cause is ongoing, but the train has been identified as a possible culprit after eyewitness accounts that the fire started right after the train passed homes along Irongate Way.